Visa-exempt foreign nationals (up to 3 months): Angola, Antigua and Barbuda, Aruba, Bahamas, Barbados, Belize, Botswana, Cayman Islands, Cyprus, DR Congo, Eswatini, Fiji, Ghana, Guinée, Grenada, Hong Kong (6 months), Jamaica, Kenya, Kiribati, Lesotho, Madagascar, Malaysia, Malawi, Maldives, Malta, Mauritius, Montserrat, Mozambique (30 days), Namibia, Nauru, Saint Kitts and Nevis, Saint Lucia, Saint Vincent and the Grenadines, Samoa, Seychelles, Singapore, Solomon Islands, South Africa, Tanzania, Tonga, Trinidad and Tobago, Turks and Caicos Islands, Tuvalu, Uganda, Vanuatu, Zambia. Nationalities eligible for visa on arrival: nationals of these countries can obtain their visa on arrival: Albania, Algeria, Andorra, Argentina, Armenia, Australia, Austria, Azerbaijan, Bahrain, Belarus, Belgium, Bermuda, Bhutan, Bosnia And Herzegovina, Brazil, British Virgin Islands, Brunei Darussalam, Bulgaria, Burundi, Canada, Cape Verde, Chile, China, Comoros, Cook Islands, Costa Rica, Croatia, Cuba, Czech Republic, Denmark, Dominican Republic, Ecuador, Egypt, El Salvador, Equatorial Guinea, Estonia, Ethiopia, Finland, France, Georgia, Germany, Gilbraltar, Greece, Guam, Guatemala, Guyana, Haiti, Honduras, Hungary, Iceland, India, Indonesia, Iran, Ireland, Israel, Italy, Japan, Kazakhstan, Korea (South), Kuwait, Kyrgyzstan, Latvia, Liechtenstein, Lithuania, Luxembourg, Macao, Marshall Islands, Mexico, Micronesia, Moldova, Monaco, Netherlands, New Zealand, Nicaragua, Norfolk, Mariana Islands, Norway, Palau, Palestine, Panama, Papua New Guinea, Paraguay, Peru, Poland, Portugal, Puerto Rico, Romania, Russia, Rwanda, Samoa, San Marino, Sao Tome And Principe, Senegal, Serbia, Slovakia, Slovenia, Spain, Suriname, Sweden, Switzerland, Tajikistan, Turkey, Turkmenistan, Ukraine, United Arab Emirates, United Kingdom, United States Of America, Uruguay, Uzbekistan, Vatican, Venezuela, Virgin Islands. Nationalities eligible for e-Visa online: Afghanistan, Anguilla, Bangladesh, Benin, Bolivia, Burkina Faso, Cambodia, Cameroon, Ivory Coast, Central African Republic, Chad, Colombia, Congo Brazzaville, Korea (North), Djibouti, Eritrea, Gabon, Gambia, Guinea-Bissau, Iraq, Jordan, Kosovo, Lao People's Democratic Republic, Lebanon, Liberia, Libyan Arab Jamahiriya, Mali, Mauritania, Mongolia, Montenegro, Morocco, Myanmar, Nepal, Niger, Nigeria, Oman, Pakistan, Philippines, Qatar, Saudi Arabia, Sierra Leone, Somalia, South Sudan, Sri Lanka, Sudan, Syrian Arab Republic, Taiwan, Thailand, Macedonia, Togo, Tunisia, Viet Nam. 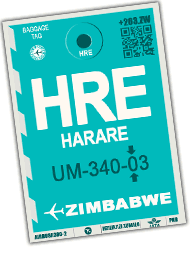 Note: a passenger who does not have Zimbabwean identity papers (passport or identity card) is considered as a foreign passenger even if he / she has a multi-citizenship and must therefore be in possession of a visa . Business visa: a Business Visa is issued to foreigners travelling to Zimbabwe for business related purposes such as consultancy or to offer services. It may be granted for a period 30 (thirty) days and is non renewable. Holiday Visa: Holiday Visa is issued to foreigners entering Zimbabwe temporarily for tourism, sightseeing, to visit family and friends or other private purposes. Conference Visa: a Conference Visa is issued to foreigners travelling to Zimbabwe for purposes of attending a Conference, Seminar or Workshop. It may be granted for a period of 30 (thirty) days and is non-renewable. Transit Visa: a transit visa is issued to visitors travelling to another country who will have a brief layover in Zimbabwe when the only reason for entering Zimbabwe is to transit. It is non-renewable. E-Visa online procedure : it is the simplest and the fastest way to get your visa. Citizens of the eligible nationalities (see above) can, within a few minutes, complete their application and pay on the dedicated website. You can obtain your visa by clicking here. It takes an average of two working days to obtain an e-Visa. However the period may vary due to a number of factors. The e-Visa is valid for three months from the date of issue. Visa on arrival: citizens of the eligible nationalities (see above) can complete these formalities upon arrival at Harare International Airport. The visa on arrival is valid for either 30 days (for visits on business) or 3 months (for touristic visits). * Updated to November 29th 2018. Conditions for obtaining visas, their rates and the nationalities concerned change regularly according to the diplomatic news. Please check systematically what formalities you are subject to.